Welcome to the Nicholson's MusiCafé JAZZ Jam Sessions Home Page! 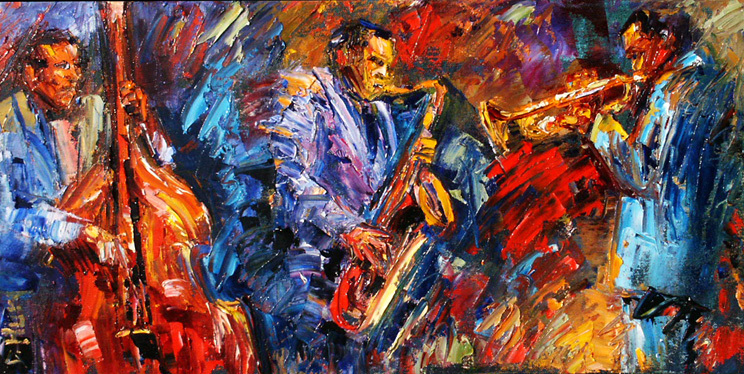 Bolivia (Freddie Hubbard / Warsaw, Poland 1991) HAIKU "JAZZ"
WELCOME! ** THE JAZZ JAM SESSIONS ARE ON HOLD UNTIL FURTHER NOTICE! ** EMAIL CHET IF INTERESTED IN FUTURE JAZZ JAM SESSIONS. Thank you to all those who come out to play. What a great opportunity for musicians of all levels of experience to play with some great professional jazz musicians! Spread the word! When there are 5 Tuesdays in the month, we play both the 4th and 5th Tuesdays!! This August we play both August 22 and August 29! Remember to tip the folks serving the drinks, etc. And spread the word! Great music every 4th Tuesday! Thank you to all who come out to play. Remember it's also about supporting each other too, so please keep your talking to a minimum and always clap after each solo (as is customary). Some in the past have played a full chorus of the melody at the end of their solo - DON'T DO THAT! Playing the actual full melody should be reserved for the very last chorus before we end the tune. Be sure you check out the photo galleries above - new pictures will be added when we have new players or special guests! P.S. Click the following link to check out pictures from the great cookout/jam session I hosted up at my place on Nov. 4, 2006! THE PARTY! Thoughts: Our format is more based on the New York style jam session. Rather than calling players up, everyone is invited to play on each tune. Just help me remember to ask the bass player and drummer if they need a break! If you have any questions about how we are running the jam sessions, don't hesitate to come to me directly, or e-mail me. Tunes: Each week it is best to come prepared with 2-3 tunes to play. Unless you bring in music of your own to pass out to the house band, please choose your tunes from the Real Book (either old or new). Come back often to check our updates and any news about surprise guests joining us and more. Any questions, just send me an e-mail. Things Players Need to Know! There are many more examples, but the above are just a few to illustrate the differences in the Rock and Chicago-style blues chord progressions, as compared to a blues played in jazz. One contact I have is Bill at SacTown ZeBops, out of Rocklin. His number is 916-502-6953. Of course there's Nicholson's Music. Their number is (916) 983-0763. EMAIL CHET IF INTERESTED IN FUTURE JAZZ JAM SESSIONS. The jazz jam sessions are held at Nicholson's MusiCafé, at 632 Bidwell St., and run every 4th Tuesday from 6:30 to 8:45. Note: when there are 5 Tuesdays in the month, we play both the 4th AND the 5th Tuesday! (unless a holiday, in which case check back here to see if we're playing). Keep listening and transcribing! See you next time at Nicholson's MusiCafé!